Heat oven to 350°F. Line cookie sheet with cooking parchment paper. Place French bread dough, seam side down, on cookie sheet. Brush dough with melted butter. Meanwhile, cook spinach as directed on box. Drain well; squeeze with paper towel to get out as much liquid as possible. In medium bowl, stir together cooked and drained spinach, cream cheese, 1/2 cup of the Parmesan cheese, the mayonnaise, bell pepper and garlic until well blended. Spoon spinach mixture into hollowed-out French bread loaf. Bake 15 minutes; sprinkle with remaining 2 tablespoons shredded Parmesan cheese. 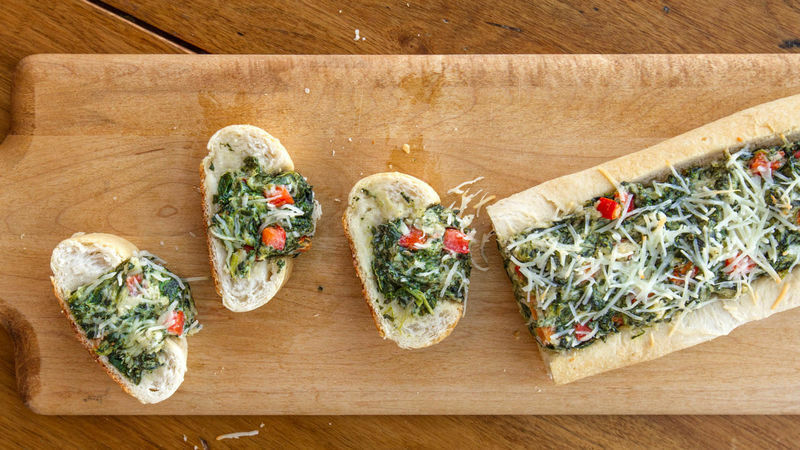 Bake 3 to 5 minutes longer or until spinach filling is hot and bread is deep golden brown. Cool 5 minutes. Cut into slices to serve. *If desired, bake bread cutout scraps. Place on same cookie sheet as stuffed loaf, and bake until bread scraps are deep golden brown.